The Brewmasters Dinners that chef Peter Birk and staff put on twice a year at Ray’s Boathouse Cafe have become legendary in Seattle. The dinners typically sell out soon after they are announced to the public, and a table can be tough to get if you don’t have your eye out for their newsletter. For $45, Ray’s Cafe puts together a special menu of food to pair with beers from mostly Washington breweries. Representatives of each brewery are on hand to talk about the beer, and Chef Birk kicks things off for each table with an introduction for the dinner. He does an amazing job of signing up new breweries for these dinners, and over the past few years I’ve probably tried beers from around ten breweries for the first time. My wife Jeanne and I have missed just one dinner over the past three or four years, and that is when we were on our honeymoon. It truly is something that we look forward to for weeks, or even months, in advance. As usual, last night’s dinner featured several new breweries. American Brewing, North Sound Brewing, Der Blokken Brewing, and Northwest Peaks Brewing are all relative newcomers to the Washington beer scene. The “veteran” brewery in last night’s lineup was Fremont Brewing, which has been open since just 2008. I had the American Brewing Breakaway Caboose Oatmeal Stout for the second time this week, and I enjoyed it just as much. Great beer. Our favorite pairing of the night was the North Sound Bitter Rain ESB paired with “Goujons” of Alaskan Halibut, Olsen Farms “chips” and a salsa verde mayonnaise. Think fish & chips. Great beer and food, and a perfect pairing. My favorite beer of the night might have been the Sacred Hop Double IPA from Der Blokken Brewing. This was the first time I’d had anything from them, and it was impressive. Hoppy, but not overly bitter and a moderately sweet finish. Not too strong. I need to visit this Bremerton, WA brewery. The Lichtenberg Dunkelweizen from Northwest Peaks Brewing was solid on its own, but it just couldn’t stand up to the ultra sweet Chocolate Pecan Cake with brown sugar caramel it was paired with. Enjoyed both the cake and the beer separately, but not the pairing. This was my first time trying a beer from NW Peaks as well. They’re a nano-brewery located in Ballard that opened toward the end of last year. Fremont Brewing will be releasing more Bourbon Barrel Abominable (B-Bomb) soon. Possibly this weekend. While they also still plan to can beer in the future, they are going to start out bottling a couple of their beers very soon. They’ll then switch to cans when the time is right for them. They will also be releasing Solstice again, which was a fantastic summer seasonal that I enjoyed quite a bit last year. 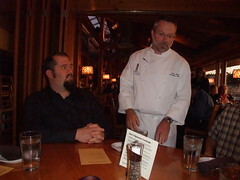 If you are interested in attending the next Brewmasters Dinner at Ray’s Cafe, it is already scheduled for Wednesday, October 12, 2011. Good luck.